This week, I finally had a chance to visit Lawrimore Project, a great contemporary art gallery here in Seattle. I was contemplating Nightmoves, by Michael Simi, which is a large circle of suspended figures that plays eerie vocal music. It reminded me of a piece of art I saw in 2004, Cosmos by Boris Achour (image to follow). I realized then that a lot of the art that has struck me most over the years has been things suspended near the ground. I’m trying to figure out what’s so compelling about something next to me hanging from the ceiling. I think it’s the implied movement; that even though the pieces often hang still, they hold the potential for movement. They are “still” like a person standing still, rather than still like an inanimate object. 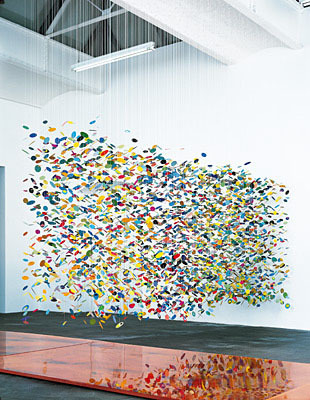 Most art never moves (or moves intentionally), but suspended art is subject to chance. 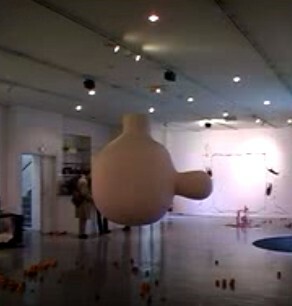 Suspended art also offers its weight as a subject. You can see the air underneath it, and its weight pulling down on the string(s). These are objects that, left alone, would lie on the ground, but are hovering among us instead. If they’re light, our movements make them tremble. If they’re heavy, they defy both gravity and our proximity. I’d love to read some art criticism / analysis on this subject, but the keywords are too common for me to find anything useful. 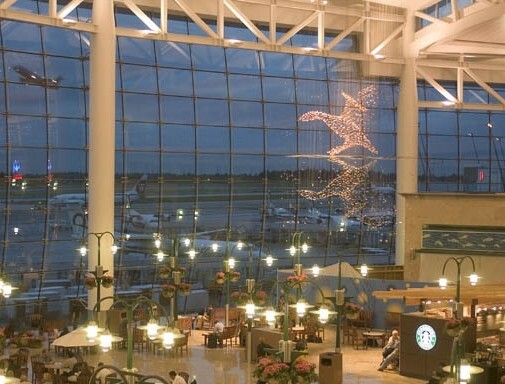 (I’m familiar with Calder’s mobiles, but I put them in a different category because they’re typically hung high above the viewer and interact with their audience differently.) If anyone can point me in the right direction, I’d appreciate it. Below are a few more of my favorites (ones I’ve seen in person). 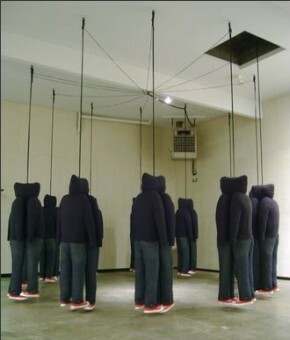 Since the appeal of suspended art is the way it interacts with you in space, these photos don’t really do them justice, but you can get the idea.